Suwa is famous for its hot spring water and with any hot spring area there are a lot of ryokan in the area. I was told by an “expert” who goes to the Nomiaruki festival once or even twice a year, and spends a night in a ryokan in Suwa at the same time, that this ryokan, Aburaya Ryokan, was pretty good. It has a reputation of being one of the best in Suwa, but lately it has had some bad reviews. I found it to be of average price and overall it was a good experience. I don’t know if I could call it the best ryokan in the world, or even Suwa, but they do have good service and I would stay in this ryokan again if the opportunity arises. 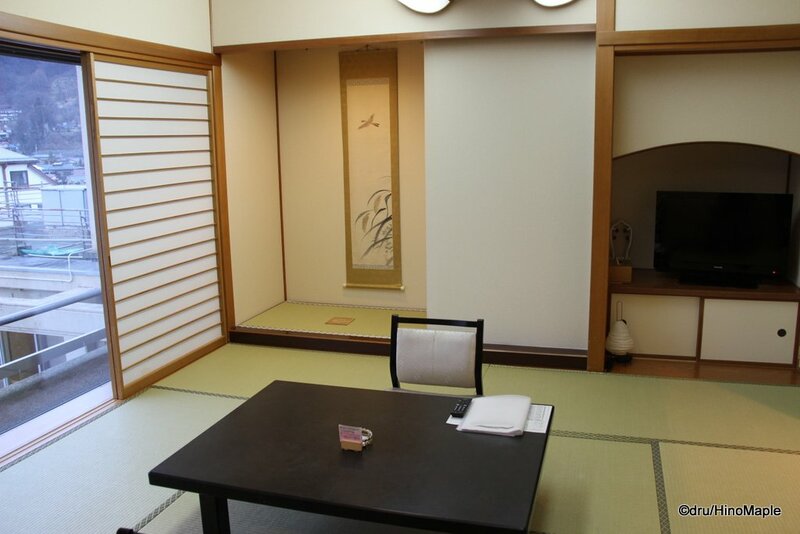 I don’t know if I would choose this ryokan again as I would probably prefer to try a different place on my next visit. I may not revisit Aburaya Ryokan again in the future but I definitely wouldn’t hesitate to say it is a good place if the price is right. Aburaya Ryokan is a slightly older yet modern ryokan in the area. The main building is pretty tall and luxurious looking but it was a bit small. 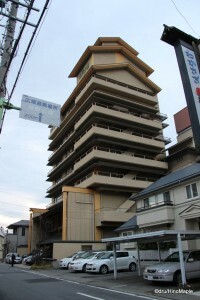 The architecture is very unique to the area and looks as if you are entering a pagoda. When you enter the main entrance, you are greeted like in any ryokan but unlike regular ryokan the front desk is more alike a hotel. 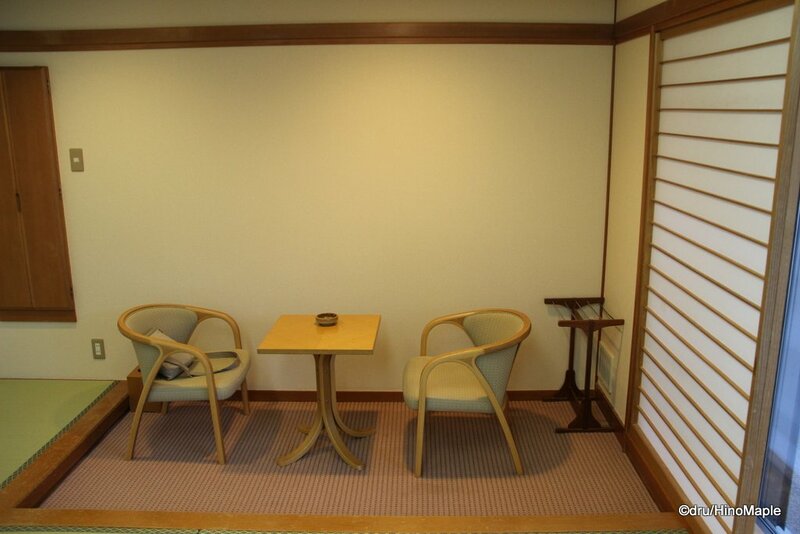 You do have to wait for someone to be available at check-in as they will show you to your room as in most Ryokan. I originally booked a regular room with regular beds as I prefer regular beds but they upgraded me and the Saviour to a Japanese style tatami room. I didn’t complain as the room was more spacious but sleeping on tatami is not my favourite thing in the world. I never experienced going to the annex side of the building so I can’t comment on that but the main tower is really nice. There are only 4 rooms on each floor and each of them is very different. The best rooms are the biggest rooms with good views of Lake Suwa. My room was the second smallest of the floor but it was still more than adequate for my stay. My room was not one of the rooms with a great view of Lake Suwa but I still had a nice view of the lake, off to the side. It was a typical Japanese style room with tatami and they also had a TV inside the room. My only gripe with the room was the fact that they had poor air conditioning controls. There was only a setting to turn on or off the air conditioning but no settings for the heat or air conditioning. When I turned it on, the heat just poured in. Being the start of spring, it was more important to have cold air come through when I arrived and warm air overnight. I ended up baking a bit in my room but it wasn’t a terrible experience. There was also a small sunken area with a table and a couple chairs. I spent a lot of time in this area as there were chairs, but it was also where I nearly broke myself and the room. As I was taking photos in the room I took a step back and needless to say I fell into the sunken area. I then proceeded to fall backwards into a chair and I was promptly seated sideways in a chair. Let’s just say I was embarrassed and laughing at the same time. 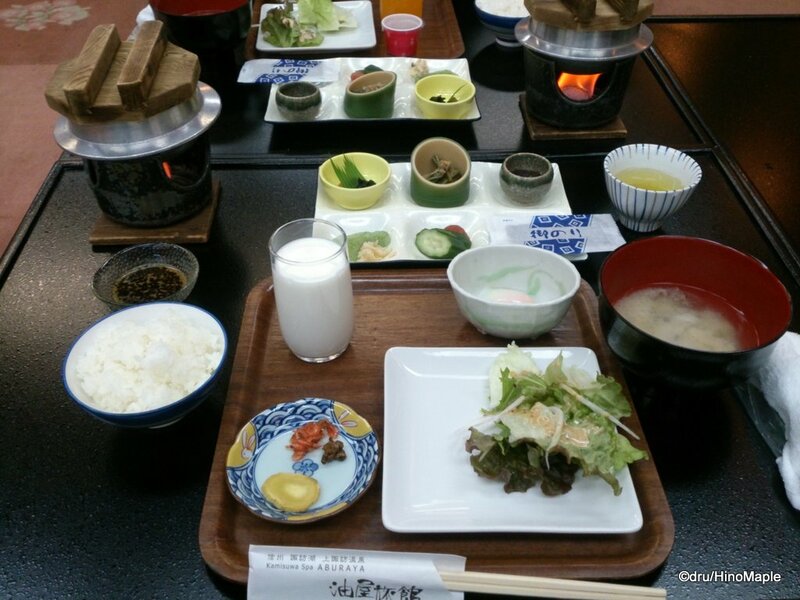 With any ryokan, you are often given dinner and breakfast as part of the room charge. The dinner I had was delightful. Dinner was located on the second floor inside a large open dining room. When going to Aburaya Ryokan, you have to decide on what time you want to eat at check-in. When I arrived in the dining hall, they promptly seated us and there was a large card with our room number on it. This made it easy to know where to go. There were many sunken tables and the entire area was open. The wood floors were well polished and looked beautiful. You could either sit seiza (1) or just sit normally as the floor under the large tables were lower than the walking area. There were several meals to choose from when booking the room and we had chosen the pork shabu shabu set that came with a carpaccio and salad. It was too much food and I didn’t eat the rice and miso soup that also came with the meal. If I did I would have exploded. When I returned from dinner I was greeted with my bed having been made. This is pretty typical of ryokan. 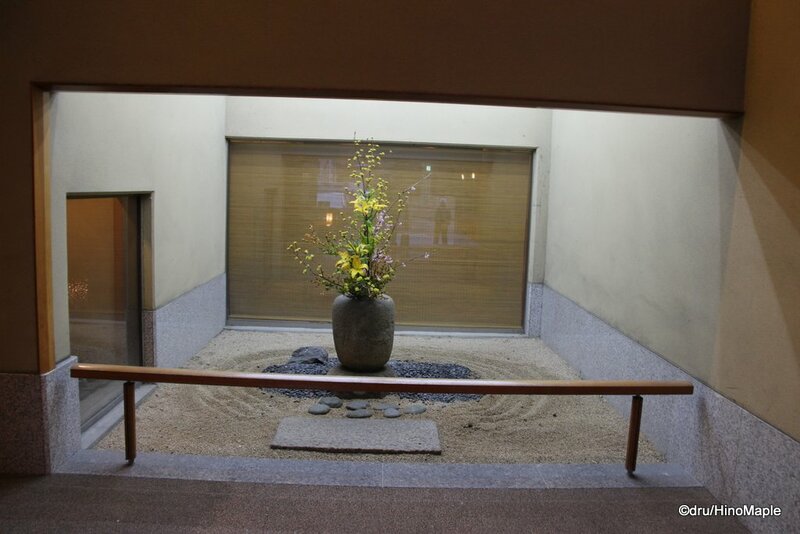 With any ryokan you visit, there is almost always an onsen area. 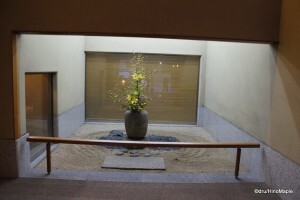 At Aburaya Ryokan, there were two onsen. The main one is located on the first floor but I didn’t go there. I went to the one on the top floor which has an outdoor onsen, rotenburo. I first entered the changing area and quickly got ready to take a shower. I opened the door and to my surprise I was greeted by two families. Two fathers and two sons were enjoying a shower together. I paused, naked except for the small towel acting like a fundoshi, to assess the situation. There were 4 showers and all 4 of them were being occupied by both families. I ended up putting my clothes back on and waiting a few minutes till they finished. When they did finish I had the entire shower to myself. It was really nice to have an onsen to yourself. It feels luxurious. When I was finished showering, the family was done with the rotenburo and I headed outside. The rotenburo was nice with a good view of the lake. Being night time the view was nonexistent and all you could do was enjoy the night lights on the other side of the lake. There aren’t any towns on the other side so there really weren’t many lights to enjoy. As I was enjoying the onsen a bunch of guys started to come into the onsen. I had enough soaking in the onsen and decided it was time to get out. I got out just in time as more and more people kept entering the onsen and I’m sure there would be a line for the showers and a bunch of people milling about in the bath. After I finished my bath, I headed back to my room and pushed the doorbell. I heard something very strange at that point. If you ever go to Family Mart, you will know this chime. The doorbell to my room was the same chime you hear at Family Mart… … After ringing the bell I discovered that the Saviour hadn’t returned from her bath yet and she had the key to our room. I ended up returning back to the onsen floor where they had seats and waited until she finished. When going to bathe, I only bring a few things as I don’t want to lose my phone. Let’s just say it was a very long few minutes of waiting as I watched the vending machine keep the drinks warm and cool. 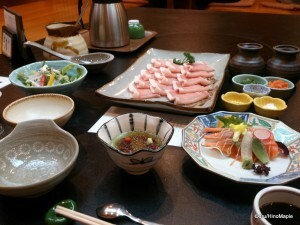 The service at Aburaya Ryokan was very good. I would say it was standard for any ryokan. They do their best to help out and I was happy that they did a lot for us; showing us to our room, making our beds, and generally being courteous. I was more surprised when they even gave us an umbrella so we could get to the station without getting wet. 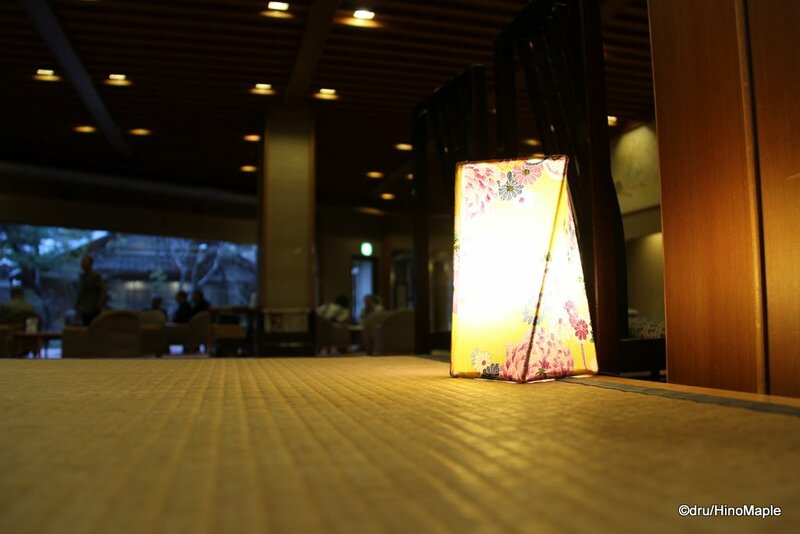 The ryokan has bright yellow umbrellas that are hard to miss and I’m sure they could easily get it back. The only instructions I had was that I just leave the umbrella with the station staff. Apparently this is a normal occurrence. They give umbrellas out and you just leave it with the station staff and they pick it up at the station later. I was happy to have it for the trip to the station and made sure to note it for the next time I visited the ryokan. I am used to going to business hotels where the service is very good but nowhere near this good. I hope to enjoy a ryokan again in the future but comparing the price, sometimes going to a business hotel and enjoying one of the local shops is a lot more fun if you ask me. 1: Seiza is a form of Japanese sitting where you sit on your feet. 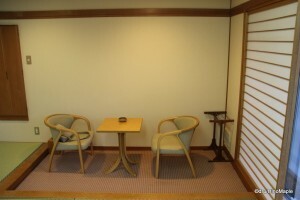 This entry was posted in Chubu, Hotels and tagged Abruaya, Aburaya Ryokan, hotel, japan, Japanese Room, Lake Suwa, Nagano, Nagano-ken, Nomiaruki, onsen, Rotenburo, ryokan, Seiza, Suwa, Suwa Lake, tatami by Dru. Bookmark the permalink. I started giggling when I read about your encounter with the family. The more the merrier? No? No. My favourite onsen experience is when I have an entire outdoors onsen to myself, in the snow, at night. Outside, in the bath, snow, by yourself? Damn, where was that so I can see if I can duplicate it! That was in the middle of the night at a small hotel in Yuzawa.